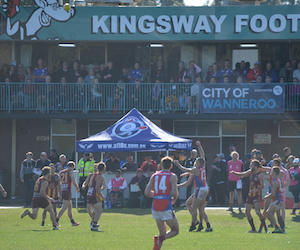 Subiaco will host their annual Good Friday WAFL match, this year in an historic first against the West Coast Reserves as the WAFL Premiers and AFL Premiers clash. Proudly supported by the City Of Vincent, the club will celebrate Family Fun Day with the third City Of Vincent Match. This is a day of Family and Footy in Leederville. There are three main entrance gates into Leederville Oval, one off Vincent Street, one off Oxford Street and one in close proximity to Richmond Street near the Loftus Recreation Centre. Nearest train station is Leederville train station, on the Joondalup Line. 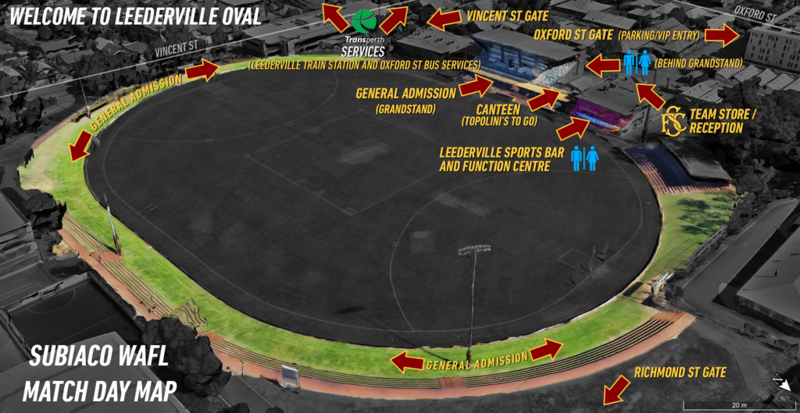 Leederville Oval is a short 8 minute walk from Leederville train station. Trains depart every 15 minutes in both directions on game day. Nearest bus stop is 12694 situated closest to the Richmond Street entrance with bus number 402, 403 and 404 stopping here. Bus stop 12676 stops on Oxford Street closest to the Vincent Street and Oxford Street entrances with bus number 15 stopping here. Parking is available at the Loftus Recreation Centre, street parking on Richmond Street and various car parks throughout Leederville. 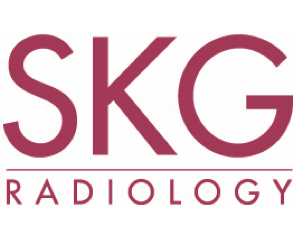 Members with parking can enter via Oxford Street and park in the S.I.D.E carpark or in ground depending on your pass. On Game Day tickets can be purchased from any of the three gates located off Vincent Street, Oxford Street and Richmond Street. Adult Tickets $15. Concession Tickets $12. Under 16s Free. EFTPOS facilities are available at both the Vincent Street and Richmond Street Entrance gates. Subiaco has an extended trading licence for Good Friday meaning our bar facilities will be open from 12pm to 10pm. Stop in and watch the Eagles Reserves on your way to Optus Stadium, or spend the day with us watching live WAFL action then the AFL on our screens. 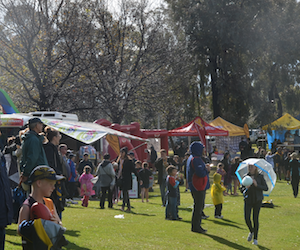 For the third year, the Subiaco Family Fun Day is proudly supported by the City Of Vincent. Local Residents can get free entry through a locally distributed flyer while the City Of Vincent are the Proud Major Partner of Friday’s game and entertainment. There are a stack of giveaways for the kids on Good Friday! A special Easter treat will be at the gates and around the game. Visit our team store where all kids will receive a free poster and a free sticker. 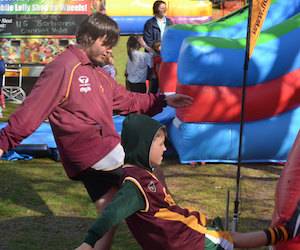 At quarter time, kids can try their luck in the Gold Box challenge, to win a footy in the Holman Kids Zone. 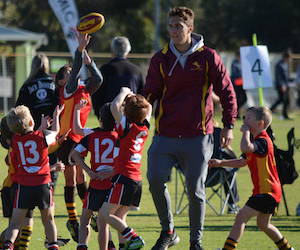 After the game the Subiaco players will be signing individual mini-footballs and distributing to kids that hang around for the end of the game. Be sure to bring the whole family for the fun next Friday. 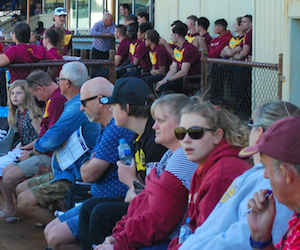 Junior footballers from Subiaco’s District clubs of Balga, Carine, Kingsley, Kingsway, Sorrento-Duncraig, Stirling and Warwick-Greenwood will parade before the league game. 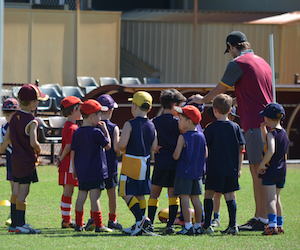 Show your support for our juniors and the next generation of Subiaco players. 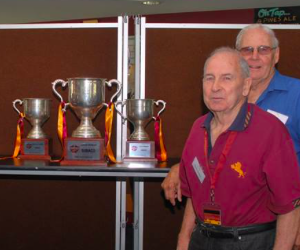 Parade will take place in front of the Subiaco members and main grandstand from 12.40pm. 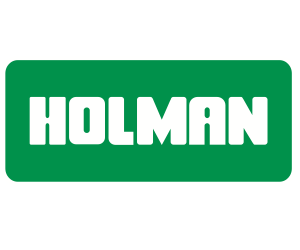 The Holman Kids Zone will be set up on the Northern bank, alongside the Subiaco members Grandstand during Friday’s game. 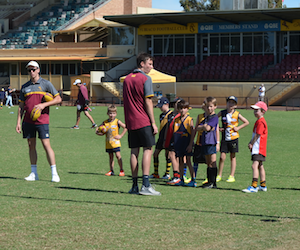 With a series of different footy activities, kids will be able to enjoy an afternoon of fun at Leederville Oval. Our 2018 Hoodie and 2018 Jacket range will both be significantly discounted on Good Friday. 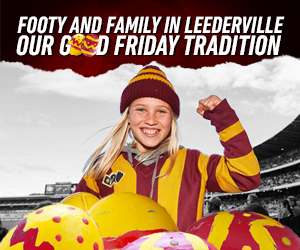 Visit the Team Store on Good Friday to grab a bargain on Subiaco Merchandise. Premiership giftware is still available for sale as well! 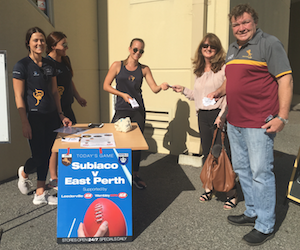 Simply spend $10 in the Leederville Sports Bar or at Topolini’s and you will receive a ticket in the draw to win a special Subiaco signed jumper! Both the West Coast V Port Adelaide and North Melbourne V Essendon games will be live upstairs in the Leederville Sports Bar across Friday afternoon and evening. Enjoy a drink in the comfort of our sports bar while taking in WAFL and AFL action. WAFL Football remains a family friendly environment. All attendees are welcome to come onto the field during the quarter breaks. Please keep a distance from team huddles and leave the ground at the sound of the two sirens. Get hamburgers, footy chips, continental rolls and all your food favourites by visiting Topolini’s TO-GO, located upstairs in the alfresco area alongside the Leederville Sports Bar & Functions Centre. Need a coffee on game day? Head to Handsome Stranger set up alongside the Subiaco members area. With great coffee available all day, help support ‘Kitch’ and grab a Handsome Stranger coffee. 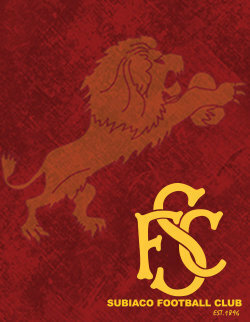 The Subiaco Team Store will open at 11.30am located on the ground floor of the Subiaco building. The team store closes at the start of the game and re-opens during half time of the league match. Memberships will be available for purchase by visiting the team store prior to the game. 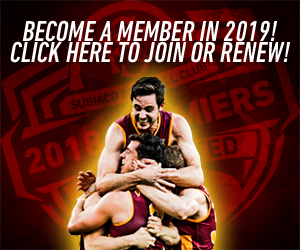 Those who already have memberships will be able to pick their 2019 memberships up by visiting the friendly team at the Subiaco Team Store. 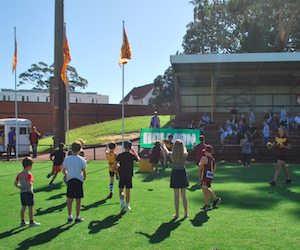 Bring your footy and have a kick on Leederville Oval during the breaks. If you need a footy please stop by the Subiaco Team Store and pick one up from $10. 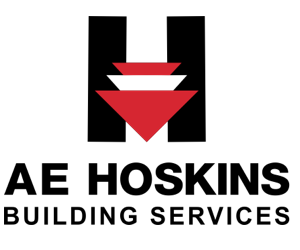 The Holman Man of the Match is here for 2019. 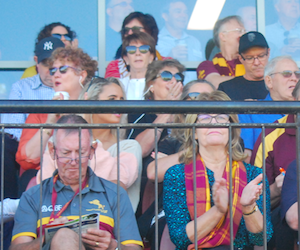 This year you can vote for your Man of the Match every week, with all weekly winners going into the draw to win an end of season, money can’t buy experience featuring behind the scenes access to a marquee Subiaco and WAFL event. 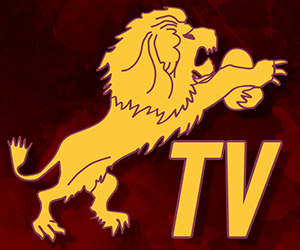 Visit Subiaco’s Facebook Page after Half-time and vote in the Holman Man of the Match. Visit Subiaco’s website next week and vote for your favourite play of the week. 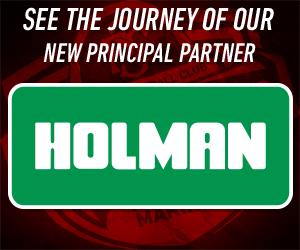 A weekly winner from Holman’s Play of the Week will go into the draw to win an end of season, money can’t buy experience featuring behind the scenes access to a marquee Subiaco and WAFL event. 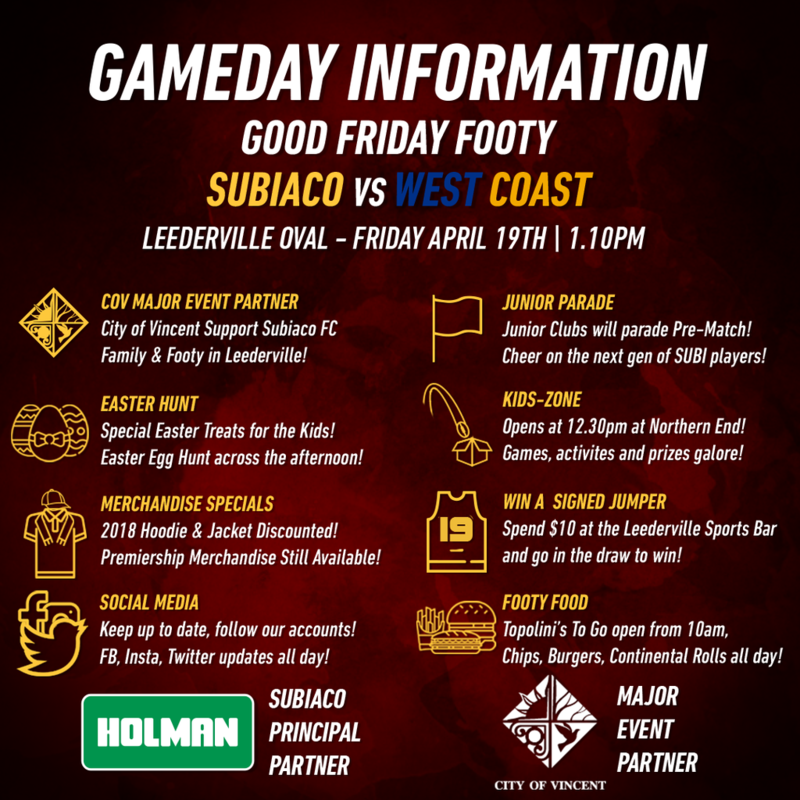 Make sure you check into Leederville Oval when attending and join the conversation by using #GOSUBI. 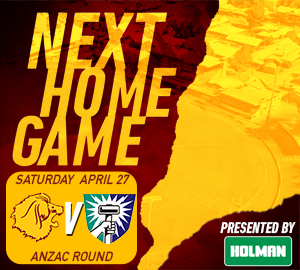 Hang around at Leederville Oval after the game, enjoy a drink while you dissect the game, watch the Eagles on our big screen, while our Futures battle on field. League player awards on stage from 4.15pm. 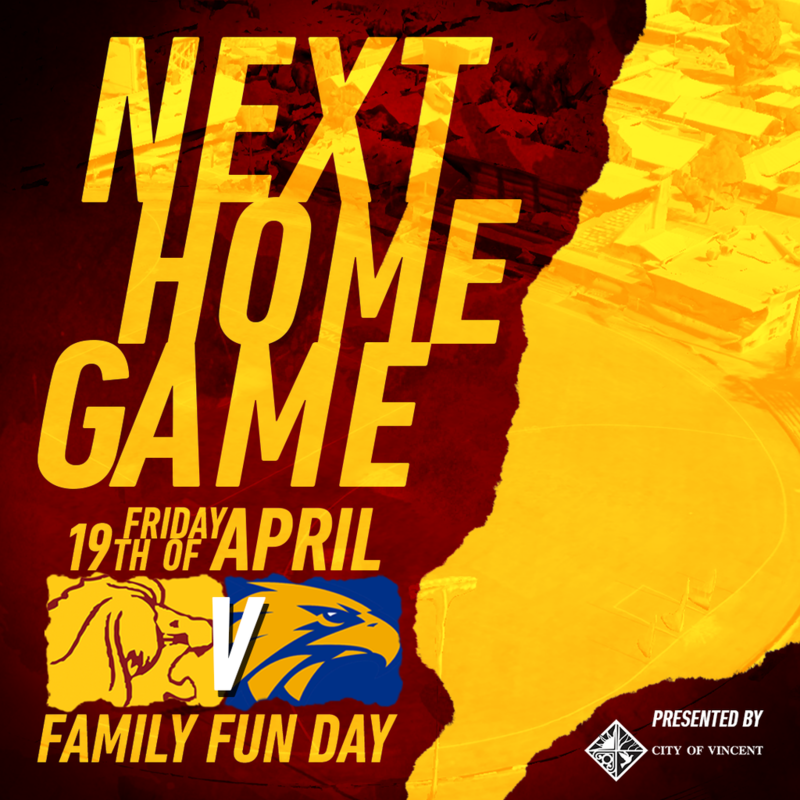 Need to get to Optus Stadium to watch the Eagles V Power match on Good Friday evening? It is simple from Leederville Oval. Make the short walk from Leederville Oval to Leederville Train Station, where there are direct non-stop trains that run from Leederville Train Station to Optus Stadium Train Station. Direct trains leave Leederville station at 5.54pm, 5.39pm, 5.24pm and 5.09pm.